With the beta dropping in a matter of days many players have already decided on what type of role they are looking to focus on and what weapons they hope to pick up. But when it comes to abilities, it’s been a little tougher to plan ahead and start that all-important theorycrafting for your special agent. Skills are your active abilities. Each agent can have a total of THREE active abilities, with the third being your Signature. Default mapping have these set as RB, LB or RB+LB (Signature) to activate and will be the main difference is playstyles from player-to-player. 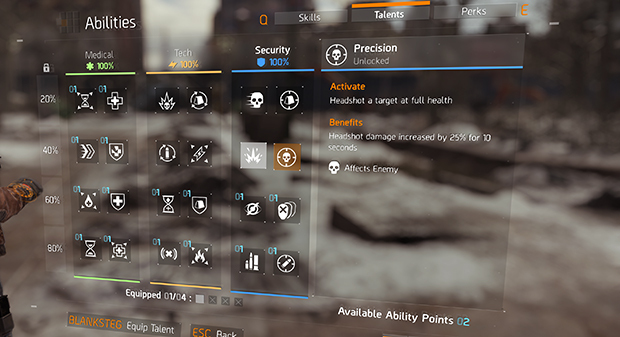 Each skill, excluding the signature, has an additional three modifications to choose from and a final “Mastery” mod which will all be unlocked via leveling, mission completion and base expansion. As a note, this Mastery mod will be in addition to the customised mod. So before we even get beyond the abilities themselves there are 16 abilities, phew! You can have a total of FOUR talents active at one time all of which directly effect a certain part of you play. These include boosts to healing abilities, buffs to damage mitigation or procs to boost damage when hitting or killing an enemy is a certain way. There are a ton of them and the combinations of these with active skills will cause a diverse sleeper community. Although to be confirmed, there are finally perks and allow either 4 or 5 (TBC) passives that do not necessarily effect your combat ability. These range from additional carry load, experience boosts, regular delivery of certain resources to your main Police HQ etc. A great possibility here is that you may be able to gain resources while offline if you have one of the resource nodes activated so if you get a deadline that needs meeting or simply don’t get as much play time as you wanted during a week, you can still at least come back to a little gift waiting in whichever wing your perk is. Below is a link to GearNuke with a list of all their abilities, skills and perks. HOWEVER, certainly not to put them down, some of their abilities and research requirements do not agree with some of the latest footage you can get hold of. 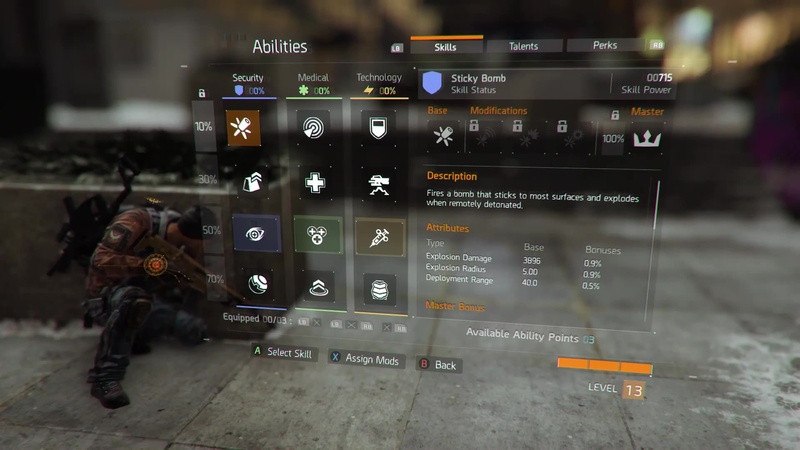 For example, Arekkz who has made a whole load of awesome videos on The Division shows some of the latest gameplay and show that the Sticky Bomb AND Seeker Mine seem to be in the Security Tree while the Riot Shield is in Tech. It’s safe to say that the abilities may still get moved round even between the beta and release in March, but at least we should have an idea of WHAT is in the game, even if we can’t confirm the exact mean of gaining them all.